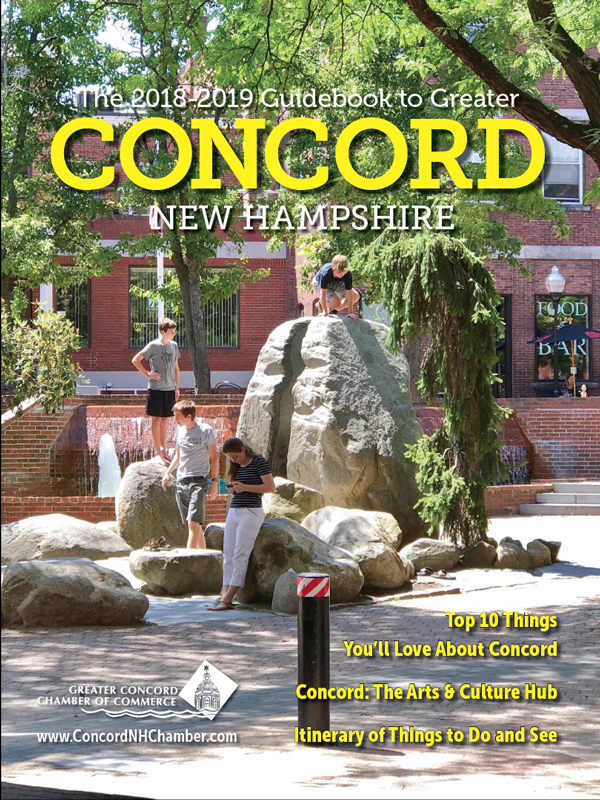 Each year, the Greater Concord Chamber of Commerce publishes the Guidebook to Greater Concord in collaboration with the Concord Monitor. As New Hampshire’s state capital chamber of commerce, we are a top resource for entrepreneurs, businesses, parents and young professionals looking to visit and/or relocate to Greater Concord. We’re proud to share this comprehensive resource that showcases the distinct and wonderful qualities of the Capital Region. It serves as a valuable tool for visitors seeking a premier cultural destination and those looking for an ideal place to live, work and raise a family. A special focus on Greater Concord’s cultural treasures, shown to have a major impact on the area’s economic vitality (view the full 2017 Arts & Economic Prosperity report on our website). An introduction to the Capital Region’s business, health care, and education systems. A diverse list of attractions, shops and restaurants that appeal to both visitors and residents. An overview of the city’s remarkable parks and recreation facilities, and a public trail system map. A summary of leading employers and industries, business resources, commercial property companies, property tax rates, population, average household incomes, and other important information about the sixteen communities we serve. A special thanks to all Chamber members who made the 2018-2019 Guidebook to Greater Concord possible by advertising in this year’s edition —you’re a major part of helping the Greater Concord Chamber of Commerce in our efforts as the Capital Region’s ambassador to the world. How can I advertise my business in the Guidebook? We're hard at work on the 2019-2020 edition and Greater Concord Chamber of Commerce members have the exclusive opportunity to advertise in our premier annual publication. Act now to take advantage of this limited-time marketing opportunity: Contact our advertising partners at the Concord Monitor at (603) 369-3212 or send an email. They'll be happy to answer any questions and reserve your ad space. Not a member? Attend our upcoming Member Briefing (lunch is on us!) to find out what membership in NH's state capital chamber of commerce is all about or reach out to our Membership Manager Kathy Bacon for information on how to join.